Think the best Halloween costumes come from a store? Think again, well they eventually come from a store but not the way you think! You can make fabulous costumes using bread bags, cupcake liners, and other basic items for your local supermarket or hardware store. Each of these costumes start with leggings and a long-sleeve T-shirt (which don't even have to match). 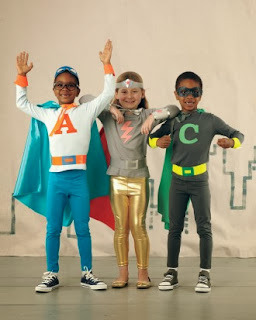 Then come the accessories: head bands, eye masks, chest letters, capes, lightning bolts, and belts. This one requires just one easy seam ~ you don't even hem the edges. If your kids can use scissors, they can help make costumes. When shopping for materials, explore your local hardware store: Most carry duct tape, painters' tape, and foil tape in a range of colors. 1. Make letter or symbol: Print a template of your choice. Cut out. Trace onto felt or paper, and cut out. 2. Make cape: Fold over 1 side of the fabric by 1 inch, and press with a cool iron. Sew down flap, creating a 3/4-inch channel. Attach safety pin to 1 end of ribbon, and thread through. (No-sew option: Snip holes along 1 edge and run ribbon through.) 3. Lay cape or T-shirt flat. Squeeze glue all over the back of the letter or symbol, and position on cape or shirt. Let dry. Wise little ones will love this quick costume. Just glue our beak template to brown frames and add brown and ivory feathers in a winglike pattern. Just add some brown clothing and you're ready to go! 1. 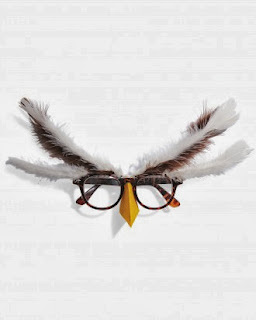 Attach a yellow beak to brown eyeglasses frames. 2. Glue brown and ivory feathers near the hinges of the frames. These girls were transformed into hula dancers in one afternoon. What's their secret? Their leis are made of vibrantly colored gift bows and their swinging skirts are fashioned from rope-style mop heads. The dancer on the left is even a ukulele player; her instrument is made out of recycled cardboard cereal boxes, a paper-towel tube, and rubber bands. 1. Cut two rope-style mop heads down their center seams to create four panels; line up side by side. 2. Cut a piece of 2-inch-wide cloth ribbon the length of the panels, plus 12 inches on each side for tying. 3. Using a hot-glue gun, apply glue to the edges of the panels; fold ribbon in half over edges. 4. Cut ribbon to desired lengths for lei, headpiece, and bracelets. For lei, make about six evenly spaced crimps in ribbon, securing each with transparent tape so it will lie flat around neck. 5. Affix self-adhesive gift bows in assorted sizes and colors to each ribbon; loop ribbons and secure ends with double-sided tape. 6. Decorate flip-flops by affixing one large gift bow to the top of each strap. 7. You'll need a small cereal box and a mini cereal box. Flatten boxes, cut along one side of each, and reassemble inside out using tape. 8. Use a foam cup to trace a circle on the center of the small box; cut out with scissors or a utility knife. Attach 3 brass fasteners about 1 1/2 inches below hole. 9. Cut 2 inches off one end of a paper-towel tube. Use the tube to trace one circle on the top of the small cereal box and another on the bottom of the mini cereal box; cut out. 10. Attach three brass fasteners to the front of the mini cereal box. To connect boxes to tube, apply hot glue to inside edges of holes, and insert one end of tube in each. For strings, attach three long rubber bands to fasteners at both ends. To the dragon's lair! Via the baking aisle! These two make an imposing knight and dragon team. 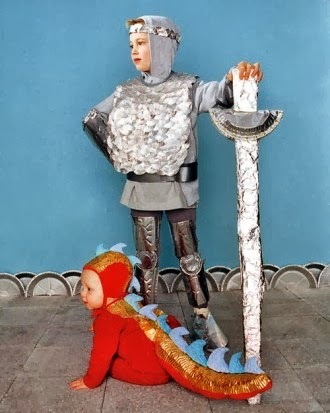 The breastplate and the dragon's scales are candy cups; the leg and arm armor is cut from aluminum pans; a folded pie tin is the hilt of the foil-clad broadsword. No need to fear the baby dragon -- she breathes milk and her spikes are made of sponges. 1. You'll need 100 silver foil candy cups; flatten and halve each. Lay a 2-foot piece of 1/2-inch-wide double-fold bias tape in a U shape. 2. Using craft glue, attach a row of half circles inside fold, leaving room for ties. Using transparent tape, add on rows of foil cups until desired size is reached. Wear over gray sweatshirt if desired. 3. Glue together overlapping foil half circles; stud with brass paper fasteners. Cover fastener prongs on inside with cloth tape for comfort. 4. Make a duct-tape belt (sticky sides facing) to cinch sweatshirt. 5. Shape pieces from foil pans. Turn edges in; staple ribbon to corners to tie. Use mini pie pans for knees. 6. Using craft glue, line the middle of the back of a sleeper and a matching hat with gold-colored candy cups cut in quarters. 7. Cut tail shape from cardboard; insert into a leg cut from a pair of red tights. Stuff with batting; stitch closed. 8. Sew wide end to sleeper. Hot-glue more gold cups to tail. Cut sponges into wave shapes; hot-glue along spine. 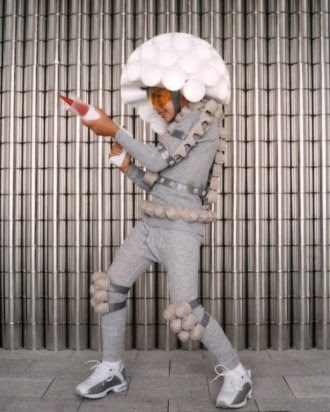 This space-age adventurer is ready to explore galaxies, thanks to his high-tech night-vision goggles, egg-carton space suit, and foam-cup helmet. His weapon ~ a cookie press with a plastic-cup-and- cone insert ~ protects him from alien encounters. 1. You'll need six bottom and two top halves of cardboard egg cartons (with "windows" on the top). With a utility knife, cut 5 diamond centers from each bottom piece, and reserve for buttons. Cut 1 bottom piece in half crosswise (for two 2-by-3-cup pieces); 3 others in half lengthwise (for six 6-by-1-cup pieces; discard one); and from another, cut 2 cups from one end and discard (for one 5-by-2-cup piece). Leave last bottom piece intact. 2. Cut the sides off the 2 top halves; discard. Curve two 6-by-1-cup pieces into semicircles by cinching together adjacent cups with duct tape. 3. On a flat surface, lay out the 2 semicircles, open side up, for neck. Attach 1 end with duct tape, leaving the other end open. For remainder of body, lay out pieces as shown, using the 6-by-2-cup piece for the back, the 5-by-2-cup piece for the front, and one top-carton piece for each arm. Use duct tape to attach these to the neck piece. 4. For the chest strap, cut a length of duct tape to go around the child's midsection; fold in half lengthwise, then tape it to the end of the front piece. 5. For arm straps, cut four 9-inch lengths of duct tape to go around the arms; fold in half lengthwise, then tape 2 to each arm piece. Place the entire contraption on child, securing neck piece with tape. Use tape to secure chest strap to back piece and to secure straps around arms. Tape reserved buttons to chest strap and arm bands. 6. For belt, tape the remaining three 6-by-1-cup pieces together end to end; secure ends around waist with tape. Use 2-by-3-cup pieces for knee pads. Fold four 8-inch lengths of duct tape in half lengthwise, tape to knee pads for straps. Put on child; secure ends with tape. 7. Use a hot-glue gun set on low to glue the bottom of a plastic cup inside the opening of a cookie press. Make a cone of red construction paper. Apply hot glue to cone's bottom edge; affix to cup. 8. You'll need about 55 Styrofoam cups; label bottoms as you work to keep track of the rows. Start with 1 cup (row 1), open side down, and space 6 cups (row 2) evenly around it, hot-gluing them where they touch row 1. 9. Glue 6 more cups (row 3) in the spaces of previous row. Continue through row 8. Glue more partial rows for back of helmet (to row 9 or 10, depending on size). 10. For strap, fold two 7-inch pieces of duct tape in half lengthwise; secure with tape. What's shaking? The Charleston is the sweetest dance in town when the flapper wears a dress of shimmying sugar packets. This gal has pink cupcake-cup roses at her hip, in her hair, and on her shoes; her necklace is a stapled strand of cellophane-wrapped candies. 1. For the base of the dress, we sewed pieces of two adult T-shirts together; you can use an old sundress instead. Start by cutting two adult medium-size T-shirts horizontally just below armpits. Then cut off the finished hem from the bottom of three sleeves (two of these will become the dress straps, and one will be used for the flapper's headband); discard the rest of the shirts' top halves. 2. On one shirt, fold and pin a tuck on both sides. Hand-stitch in place at top and bottom (shirt will fit closely at the hips and chest and billow slightly at the center). Turn inside out. 3. Trim other shirt to this new width (leaving enough fabric for a small seam allowance); turn inside out, and machine-stitch trimmed edges together. 4. Line up cut edges of both shirts, with hems at top and bottom; sew shirts together to make one tube. 5. For the straps, cut two of the sleeve hems so they're no longer loops; line up with tucks, and sew to dress. 6. For the fringe, place sugar packets side by side, and staple together at top to form a strip; packets should not overlap on side ~ the dress will get too heavy. 7. Make each strip long enough to wrap around the dress (we used about two dozen packets per row); 8 to 10 rows should suffice. Slip a piece of cardboard inside the dress to separate the layers, then hot-glue strips to lower half of dress, beginning at the bottom ~ the rows should overhang each other slightly to hide staples. 8. To create a scalloped edge along bottom hem and at the waist, fold paper cupcake holders in half; attach using hot glue. Dress can be worn over a white leotard and fishnet tights, if desired. 9. You'll need 8 to 10 cupcake cups to decorate the headband and shoes, and 10 to 12 larger paper muffin cups for the cabbage rose at the hip. Fold the cups in half, one or more at a time, varying the number you use. 10. Nestle one half circle inside another on the perpendicular; staple together at the center. Build the flower by adding more and more "petals," placing each at a quarter turn every time; staple each layer. 11. When finished, pinch, twist, and rustle the paper for flourish. Thumb the crimped edges; trim the interior of the flower with scissors. Cover the staples on the back with tape. Attach roses to fabric with hot glue; use small safety pins to secure to ballet slippers. 12. Staple cellophane-wrapped candies end to end.